2 September 2008, at 6:07a.m. UK - Sergio Neale, head chef and co-owner of The Golden Boar in Suffolk, whipped up a storm in the kitchen in London and was crowned the Eggs Factor winner of the South-East region. 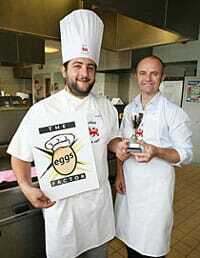 He impressed judges with his eggcellent cooking skills, and sparkling personality. Budding South East egg chefs battled it out in the Eggs Factor regional cook-off held at Southgate College on 1 September. The competition to find the new ‘Face of Eggs’ received more than 500 entries which have been narrowed down to 12 finalists in each region who will compete across UK kitchens throughout September. Martyn Nail, Executive Chef of Claridge’s Hotel, was on hand to judge the South East finalists on their ability to poach the perfect egg and create a signature dish using British Lion eggs. Martyn was impressed with Sergio’s scrumptious signature egg dish – a deep fried egg served with pea, bacon and chicory salad with a yolk and thyme dressing. Sergio will now compete against regional winners from all over the UK in the Eggs Factor final, also being held at London’s Southgate College, on 6 October. Michelin-starred celebrity chef Paul Merrett will be drawing on his expertise to decide just who will be crowned the ‘Face of Eggs 2008’.